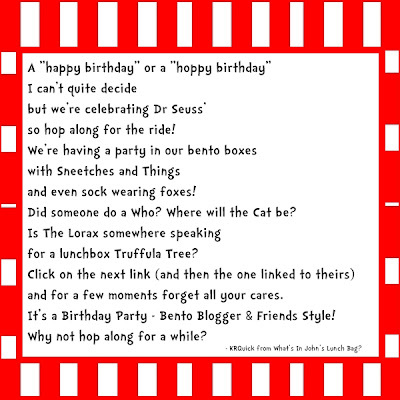 Mamabelly's Lunches With Love: Happy Birthday, Dr. Seuss! Have a great Read Across America and Dr. Seuss Birthday - Day! haha, these turned out great Nina! love them all. 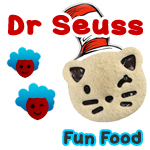 :) oh i just love all these Seuss lunches, so much fun! Thanks, guys! I am just starting to look at everyone's post. This is so fun! Super tasty bentos, very creative! They're all so cute! I love your "read" message! Thats my favorite! So creative, love the hat with the stripes! great lunches! I love the simplicity of the bread w/3 fishes! The Lorax is amazing! I agree with Kandce... the "read" message it a MUST! Where did you find blue Goldfish? These are all so good! Love the cat's apple bow tie!